Good: Great concept, new comic story and art, format encourages collectors to go after the entire set. Bad: Not much value, too many multi-panel cards, numbers are extremely hard to make out. 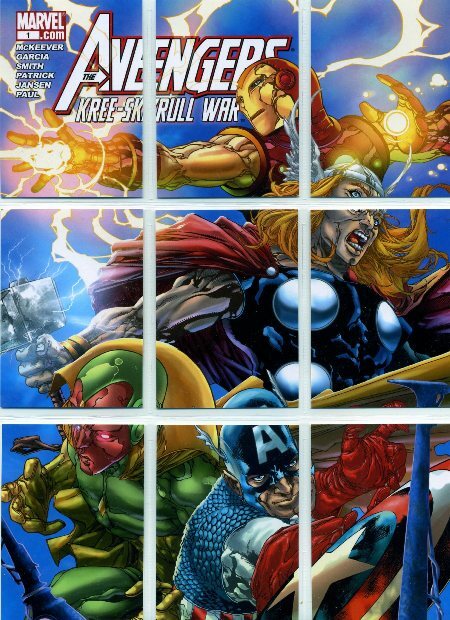 The Bottom Line: 2011 Upper Deck The Avengers: Kree-Skrull War is a set that probably sounded great during a brainstorming session. It takes the idea of a comic book story and applies it to trading cards. Offering an all-new Avengers comic, the set should have excited both comic readers and card collectors. However, the final product doesn't convey the same promise. Lacking in value, the set is essentially a really expensive comic and not a very good one at that. That said, the idea does have a lot of potential. Despite some major flaws, a couple of tweaks could offer tremendous legs for possible new sets. I always appreciate card sets that offer new comic art. Not only does Kree-Skrull War have that, but every card is double-sided meaning twice the art. Manuel Garcia and Bob McLeod do a solid job with the Marvel characters. When placed in pages, the set does look good. However, with the cards acting as comic panels, far too many of them are part of multi-card layouts that don't stand well on their own (unless you want a card showing a pair of superhero boots). I would have preferred that more panels be limited to single cards as they would work both by themselves as a card and fit into the larger comic picture. For the base set, this isn't a huge problem because completing the entire book isn't too difficult. However, for the short print chase comics, it's tough to get excited about a half-finished comic. Another major flaw in the base card design is the faint numbers that are extremely hard to see. I understand the desire of not wanting to intrude on the artwork, but the nearly opaque white is very hard to see. Couple that with the fact that the number placement isn't consistent throughout the set and you've got a lot of eyestrain and frustration. At 90 cards, the base set is just right. For those who enjoy the story and want a little more, the chase sets are tough to complete but not impossible. Although I like the idea of having the Character and Retro chase sets to give background, they're far too common, usually falling a couple per pack. Upper Deck has been pushing out a lot of Marvel-themed sets this year, all around the same price point. But while Marvel Beginnings and Thor gave you three hits per box, Kree-Skrull War has none. In fact, sketch cards are one in 18 boxes. I'm not all about the hits, but when two products are similarly priced, they expect similar results. Sure, original art may cost more to produce, but going from three hits to zero is extreme. If boxes were $20 less, it'd be a different story and the lack of high-end chase would be understandable. Plus, with sketch cards, it's all about the artwork and not the logo on the card stock. Just because Kree-Skrull sketch cards are extremely rare doesn't give them much of a premium. The fresh concept that anchors Kree-Skrull War makes it a release worth noting. However, I can't help but think of ways to build upon the idea rather than praise what's in the final release. Getting the set together, putting it in pages and reading it over is a fantastic way to encourage interacting with the cards. I do like the idea of using cards to tell a comic story. Because there's not much content outside the five Avengers tales, buying a box is similar to paying $50 for a single comic. At that price, I'd rather spend it on an early issue of The Goon. AVENGERS KREE SKRULL WAR ULTIMATE MASTER SET (253) All Chase + LE Binder !!! 2011 Upper Deck The Avengers: Kree-Skrull War trading cards are probably unlike anything you've collected before. Mashing up the comic book and trading card formats, the set offers an all-new comic starring the Avengers from Marvel Comics. 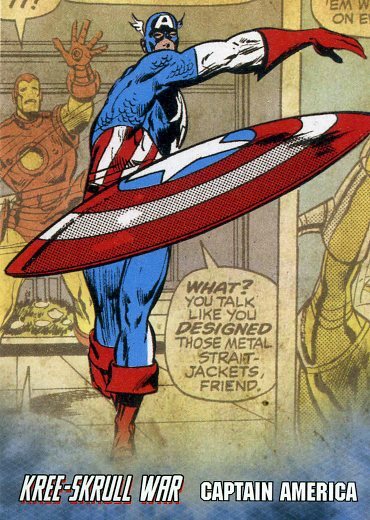 Set firmly in the Marvel Universe, the story takes place in the same time frame as the original Avengers comics #89 through 97, which were released in the 1970s. The card set has a total of five all-new stories written by Sean McKeever with art by Bob McLeod and Manuel Garcia. The main story can be considered the base set, with the four shorter stories acting as a chase element. Other inserts include three sets of Cover cards, Retro and Character cards. High-end chase cards are extremely tough with sketch cards falling 1:432 packs. Printing plates are also inserted. 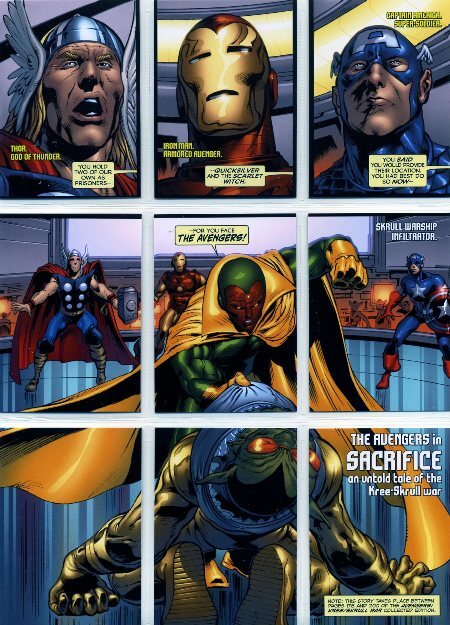 90-card base set builds a 20-page Avengers comic titled "Sacrifice." Four chase card comics: The Debt (eight pages, 36 cards), The Fall (six pages, 27 cards), Power (four pages, 18 cards) and Soldiers' Honor (four pages, 18 cards). Sketch Cards (1:432) are extremely tough to come by and include original art. Printing Plates provide another higher-end chase. Each pack includes one Cover card, with nine cards completing the puzzle. Collectors can also track down rarer Variant Cover and Black and White Cover cards. Retro and Character cards showcase the characters collectors encounter in the various stories.